Advanced techniques and instruments are required to be able to observe how molecules stretch, bend, transform, or break during chemical reactions. These instruments should be able to observe and monitor all the atoms in a molecule and how they respond to such a change, with sub-atomic spatial and few-femtoseconds temporal resolution. Nearly two decades ago, researchers proposed the concept of using the molecule’s own electrons to capture snapshots of the structure and to observe, in real time, the molecular reaction. 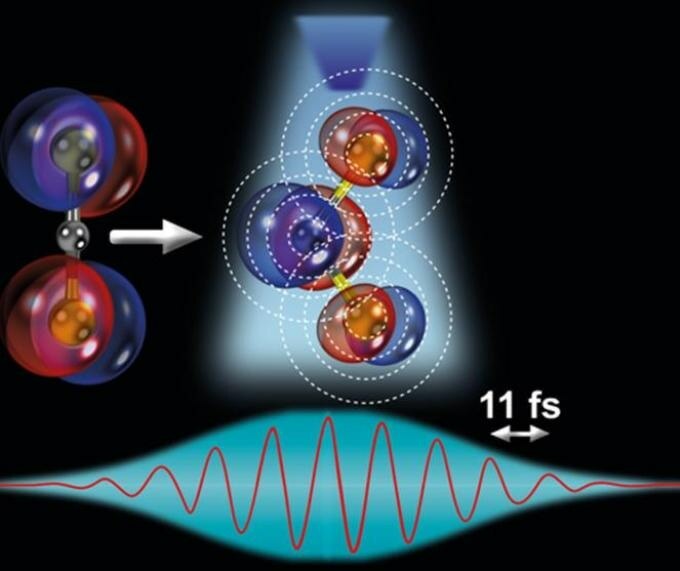 A progress in imaging complex molecules was achieved in 2016 when the group of scientists, headed by ICREA Prof. at ICFO Jens Biegert, could realize the needed spatial and temporal resolution to capture snapshots of molecular dynamics without missing any of its events, reporting on the imaging of molecular bond breakup in acetylene (C2H2) [Science 354, 308 (2016)]. Currently, the research team has gone past its earlier discovery and accomplished another remarkable milestone in their study. In a recent research reported in the Proceedings of the National Academy of Sciences of the United States of America (PNAS), ICFO scientists Dr Kasra Amini, Dr Michele Sclafani, Dr Tobias Steinle, Aurelien Sanchez, led by ICREA Prof. at ICFO Dr Jens Biegert, have been able to view the structural bending and stretching of the triatomic molecular compound carbon disulfide (CS2). This research was performed in collaboration with ICREA Professors at ICFO Maciej Lewenstein and Javier García de Abajo and former ICFO researchers Jose Martinez, Michael Hemmer, Michael Pullen, and Benjamin Wolter, together with researchers from the University of Warsaw, Kansas State University, Friedrich-Schiller University Jena and the Abbe Center of Photonics, the Max-Planck-Institute für Kernphysik in Heidelberg, and Physikalisch-Technische Bundesanstalt in Braunschweig. The research team observed this phenomenon by using laser-induced electron diffraction, a molecular-scale electron microscope that enables researchers to have a glimpse of the molecular world to take clean snapshots of the geometry of the molecule with combined sub-atomic picometre (or pm, where 1 pm = 10−12 m) and attosecond (or as, where 1 as = 10−18 seconds) spatiotemporal resolution. According to the researchers, the ultrafast modifications in the molecular structure are caused by variations in the molecule’s electronic structure, controlled by an effect called the Renner-Teller effect. This effect is very important for significant triatomic molecules like carbon disulfide, CS2, as it can establish particular chemical reactions in the earth’s atmosphere that could, for instance, influence the climate conditions. At present, for the first time, the researchers could directly image this effect in their experiment, capturing snapshots in real time and observing the molecule stretch symmetrically and bend in a linear-to-bent structural transition within a time span of ~85 fs (8 laser cycles). This could be achieved by using a sophisticated quantum microscope formed of (1) a mid-infrared 3.1-μm intense, femtosecond laser system illuminating a single CS2 molecule with 160,000 laser pulses per second and (2) a reaction microscope spectrometer with the potential to simultaneously detect the complete three-dimensional momentum distribution of the electron and ion particles produced as a result of the ionization and sub-cycle recollision imaging of a single isolated molecule. The researchers also confirmed their experimental outcomes by performing advanced quantum dynamical theoretical simulations, and verified the match between theoretical and observational results, validating that ultrafast linear-to-bent transition is, in fact, enabled by the Renner-Teller effect. Outcomes such as these denote a significant step toward gaining insights into the underlying effects that occur in molecular dynamic systems.